The Battle Against Hooters: What About The Children? Here is a new way to take legal action against Hooters, which has seen it in so many interesting ways: Complain to the police that it's adult entertainment that caters to children. That's what the NOW chapter in San Francisco just did, taking their complaints to the local police department. 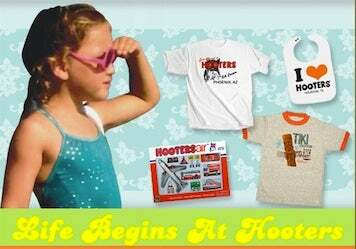 It may be the first time a feminist group has complained that an organization is too family-friendly — their evidence included the fact that Hooters offers child menus, high chairs and booster seats. We also found this fascinating "about" statement on their website, which clearly stems from the legion lawsuits filed against the company over the years (for weight discrimination, for discrimination against an Asian American flight attendant on their airline, for discriminating against men by refusing to hire them). According to ever-increasing sales figures, the Hooters concept must be acceptable to a large majority of American consumers. Hooters believes critics of the concept are a vocal minority of politically correct minded individuals. This group sometimes states the concept "constitutes a hostile work environment," but just the opposite is true. Do I have to be a certain age to enter a Hooters restaurant? No, Hooters restaurants are family friendly and kids are often the stars of the show. "Each and every time Hooters, Inc. claims that they are not a restaurant but that they are rather vicarious sexual entertainment," she told a local station. "So their workers are not food servers or waitresses. Their workers are sexual entertainers." And in San Francisco, adult venues can't serve to minors. Let's see if it works.